Product prices and availability are accurate as of 2019-04-16 17:43:19 EDT and are subject to change. Any price and availability information displayed on http://www.amazon.com/ at the time of purchase will apply to the purchase of this product. Grow a garden filled with wildflowers that will attract an array of beneficial insects. The plants included in our Bird and Butterfly Wildflower Mixture will attract butterflies, bumblebees & honey bees, ladybugs and even hummingbirds as well! All plants will grow to a varying height of roughly 8 to 60 inches tall, with the majority ranging between 12 to 36 inches. A large sum of the flowers included are annuals, making up 70% of the blended seeds. You then have your perennials & biennials which account for about 30% of the seed mixture. Annuals will grow quickly from freshly harvested seeds. 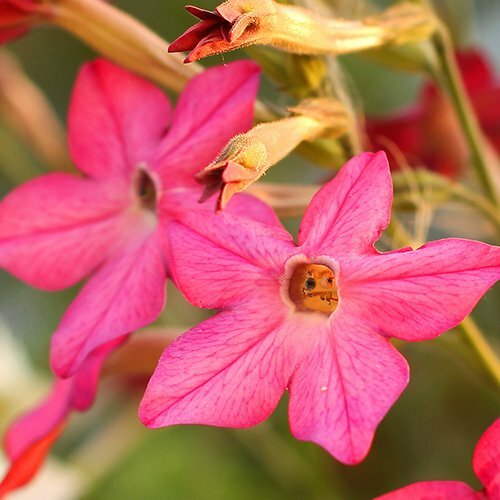 They bloom profusely through the summer months and later die with the first killing frost. Seeds can easily drop to the bare ground beneath, regrowing fresh plant life the following year. Perennials will establish a deep root system within the first year of growth. The plant life will then wilt on the surface, later returning the following Spring. 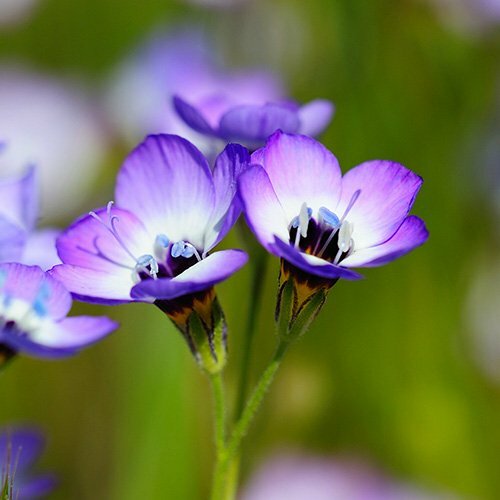 This blend of Wildflowers will produce plants in practically every color of the rainbow, from red, orange, yellow, blue, violet and even green & white. 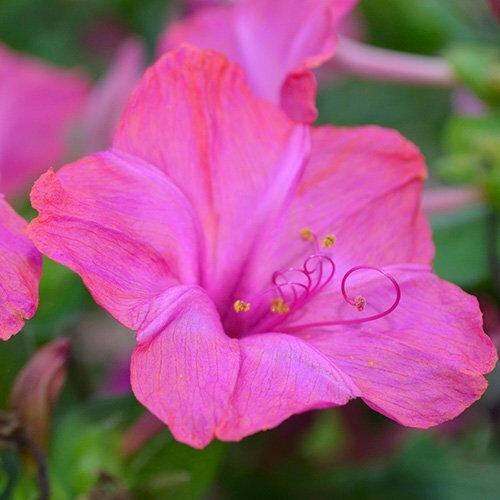 A few popular favorites are Asclepias, Aquilegia, Cosmos, Nasturtium, Zinnias, Palaver & more. 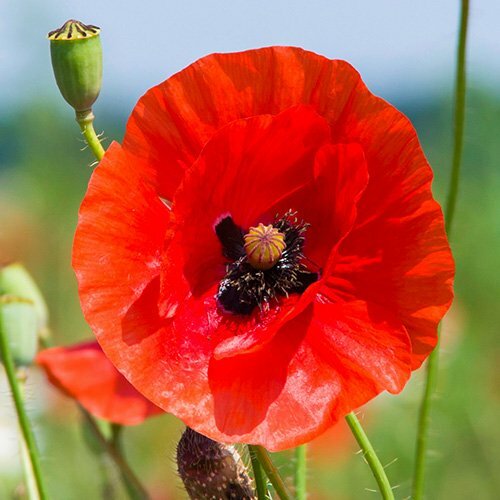 Quality Wildflower seeds packaged by Seed Needs. Each packet measures 4.50 inches wide by 6.4375 inches tall. 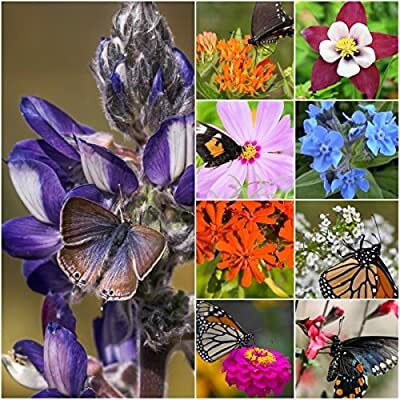 This specialty Bird and Butterfly Wildflower Mixture will produce a colorful blend of flowers that attract an array of beneficial insects to the garden, such as butterflies, honeybees, bumblebees, hummingbirds and more! All plants will grow to a varying height of roughly 8 to 60 inches tall, with the majority ranging between 12 to 36 inches. 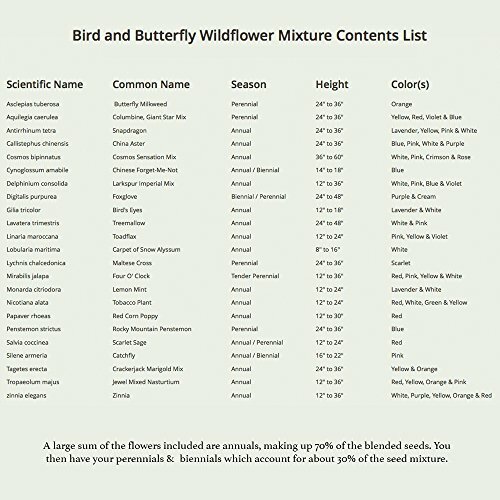 This Bird and Butterfly Wildflower Mixture consists of 23 individual species, 70% of which are annuals. The remaining varieties are perennials and biennials. All Wildflower seeds sold by Seed Needs are Non-GMO based seed products and are intended for the current & the following growing season. All seeds are produced from open pollinated plants, stored in a temperature controlled facility and constantly moved out due to popularity.